A Steam Train, a Samichlaus, the Sihlwald & 4 excited small boys! - Time for a nice cup of tea? A Steam Train, a Samichlaus, the Sihlwald & 4 excited small boys! A few years back I was running along the Sihl on a winter's evening and out of the mist appeared a Hogwarts-ian vision of a steam train. Huh? 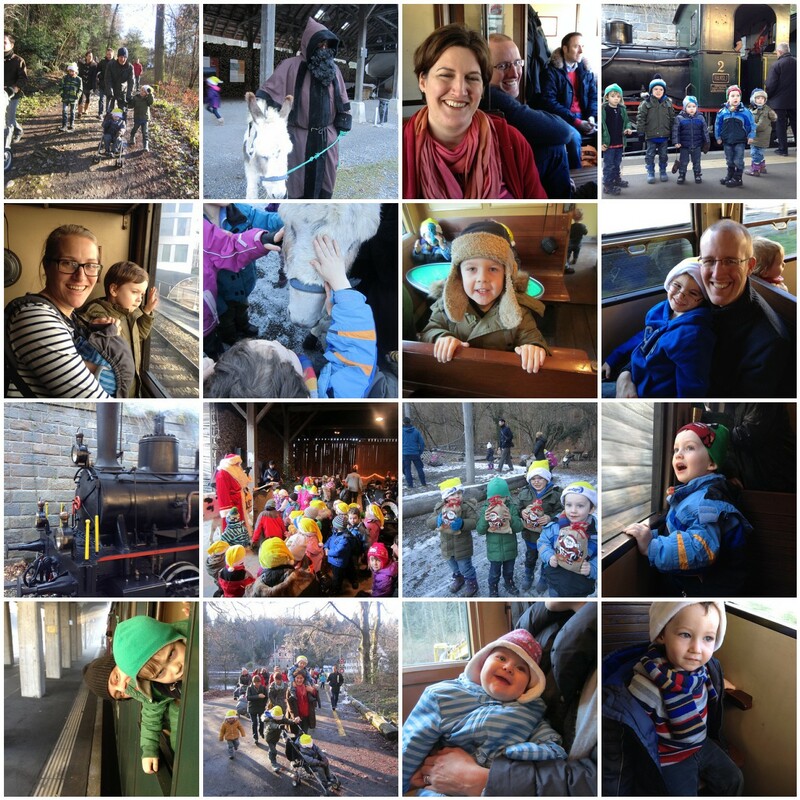 Fastforward to Dec 2013 and 4 families are getting on the Museumsbahn to visit Samichlaus in the Sihlwald forest. Markus, Patrick, Drew, Hector, Venus were more than excited by this adventure and we go to Bahnhof Wiedikon (our local station) especially early to admire the train. A journey of 30 minutes, lots of sticking heads out of the windows, lots of grime and then out at Sihlwald. We were met and directed through the forest for a gentle 20 minute ramble, met halfway by authentic Samichlaus, Schmutzli (his helper, dressed in brown) and a real honest to goodness donkey. Lots of good photos opportunties, but hard working pushing the buggies and keeping hold of overexcited small boys. The barn was decorated and had trestle tables with food and snacks. Then Samichlaus talked to the children (or as my brother said, gave a party political broadcast of some sort) and some swiss kids performed. Ours didn't. They just kept eating, then whining, then wriggling. Eventually, all the children queued and got their sacks of goodies and a yellow hat. Cue more photos. We just had time for a quick play in the playground, before the route march back to the train. Marvellous! Good start to Christmas. This was definitely the highlight for me of Chris and Drew's visit!